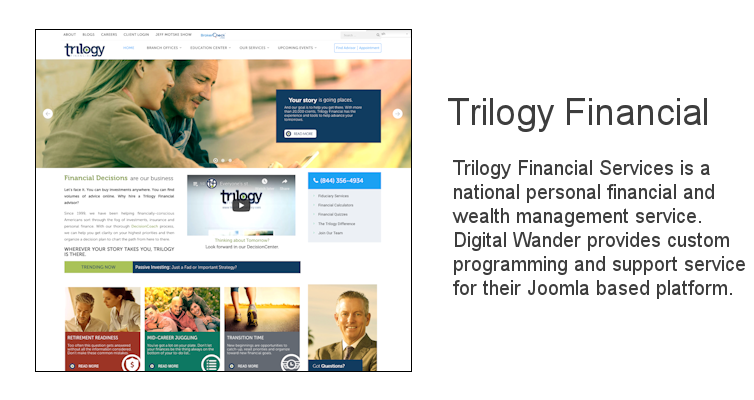 Trilogy Financial Services - Digital Wander, Inc.
Trilogy Financial Services manages over $2 billions assets with over 150 advisors in 10 regional offices. In today’s hyper connected world, Trilogy continues to leverage all modes of mobile and social media strategies to continue growing and providing excellent financial services to its clientele. This entry was posted in Web Applications by digitalwander. Bookmark the permalink. Copyright © 2019 Digital Wander, Inc.. All Rights Reserved.